"Take heart, O Illustrious Majesty. For your people are Redguards, which means they come easily to the Way of the Sword, and once they have their hands once again on the hilts of blades, and learn to quote once more from the Book of Circles, they will be a match for any folk in all the round world, be they ever so numberless." In ancient times, the Yokudan people were once artisans, poets, mystics, and scholars, but the constant civil wars that plagued the nation resulted in many searching for enlightenment through the Way of the Sword, also known as the "Song of the Blade". This eventually developed into a martial tradition known as sword-singing. Through the forging of beautiful swords tempered with magic, their artistry and poetry not only survived but flourished. Sword-singers believed that the sword was superior to other types of weaponry, and were to devoted to using it exclusively. Anything else would only lead to confusion in their path to seek mastery. The sword-singers built temples to the gods of war and training halls named the "Hall of the Virtues of War" in which they could practice their combat skills and the art of forging powerful swords. They venerated warrior-gods such as Onsi, who showed early Yokudans how to pull their knives into swords, Diagna, an avatar of the HoonDing who brought them orichalc weapons and Leki, the goddess of aberrant swordsmanship who introduced the singers to the "Ephemeral Feint" maneuver. The sword-singers initially recruited from among the offspring of noble families. New members were accepted into the order at age eleven. 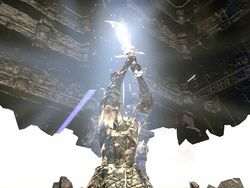 Males became known as "Brothers of the Blade" while females earned the title "Maidens of the Spirit Sword". In later centuries, mastery of the Way was achieved upon completing the Walkabout—a wilderness trek emulating the life of Frandar Hunding, where singers would wander the countryside defeating monsters and aiding the citizenry in the name of virtue. The Walkabout could take years to complete and some singers didn't survive the trials. Although the sword-singers were never a numerous people due to harsh and unforgiving desert lifestyle, they had a significant influence on Yokuda. Within a few generations, the Way of the Sword had become their life and was ingrained into Yokudan culture. For the singers, the sword was seen as an extension of their soul and a symbol of honor. They maintained that it was the swordsman, not the sword, that mattered. Various legends and tales speak of masters requiring only a simple wooden training sword to defeat their adversaries. Such was the influence of the Way of the Sword to Yokudan life, that everyday items bore depictions of swords or warriors assuming fighting stances. The greatest among the sword-singers were known as "Saints of the Sword", or Ansei in Yoku. Ansei had the ability to manifest a sword from their very soul, known as a Shehai or "Spirit Sword". By sheer force of will, an Ansei warrior could create this ethereal sword of pure thought and it would take shape in their hand. This form of the Way became known as "Shehai Shen She Ru" or Way of the Spirit Sword. All sword-singers trained to learn this form through intense training and meditation in the Way of the Sword, but not every swordsman was successful in becoming an Ansei. Those who could were said to be more than mortal. They possessed intense devotion to the gods of war, immense piety, and a focus and skill far beyond what others could ever achieve. Conversely, there have been certain gifted individuals who could form a Shehai from a very young age or with little or no training. Other times, a Shehai may be formed in times of great stress. To become an Ansei of the first-rank, a sword-singer had to demonstrate an ability to form the Shehai. These Shehai were described as typically pale, misty, insubstantial, and as if it was made of light. Sometimes its shape wouldn't even be particularly sword-like, and would be of no use as an actual weapon. Ansei wishing to earn the elite title of first-rank were required to give up their most treasured weapons and war materiel before undertaking a grueling initiation ritual. If they succeeded, they would no longer need conventional weapons. Ansei of the second-rank and above were known to have the ability to not only form the Shehai, but wield it as a weapon in battle. Their Shehai shined brighter and was much deadlier. Described as an "unstoppable weapon of great might" that could cut down foes like "a scythe through wheat", disarming such an Ansei could only be done by severing their head or taking their mind. These swordsmen often began their own training schools, teaching their individual way of the sword. There was some evidence, however, that suggested the Shehai of an Ansei could be shattered, leaving behind only its essence. Ansei of the highest virtue wandered the countryside engaging in battle, righting wrongs, and seeking to end the strife. To them, manifesting the Shehai was said to have come as naturally as breathing. When the Warrior constellation temporarily took a mortal form in the mid-Second Era, he wielded an extremely powerful Shehai that was capable of producing shockwaves and magical storms. There had always been a divide between the commoners of Yokuda and the sword-singers. Although much was done to ease tensions in the empire, Randic Torn, the ruler at the time, revived the gulf by introducing restrictions on the wearing of swords. "Torn's Sword-Hunt", as it was known, meant that only the singers were allowed to wear swords, which distinguished them from the rest of the population. After Randic Torn's death, a vicious civil war broke out. Among this chaos the most accomplished sword-singer in history, Frandar Hunding, grew up. Hunding was so skilled in swordsmanship that by the age of fourteen he could use his abilities to provide for his mother and four brothers. When the war broke out, Hunding was still a young man, but a formidable sword-singer in his own right. By the age of thirty, he had gained such skill and mastery that he finally stopped using the real swords and began using the Shehai. In order to pass on his insights and knowledge, he wrote his own philosophy on the "Way of the Sword". Named the "Book of Circles", it was seen as the definitive manual for sword-singers in the centuries that followed. In 1E 780, Emperor Hira attempted to wrestle control of the empire from the people by exterminating the sword-singers. The singers were few in number and unequipped to join together into an army that could defend their homes and lives. Frandar Hunding, who the singers saw as their hero, led a rebellion against the emperor in what became known as the War of the Singers. Hunding was victorious, but less than twenty thousand sword-singers survived. Unappreciated among the citizenry and no longer welcome, Hunding and his army left Yokuda and began their great migration to Hammerfell. "These ... infidels call us barbarians. They would drive us from this land. But what the Elves do not know ... is that Ruptga himself guided us to these shores! He decreed that the Alik'r would be our home! Today, the infidels will see the strength of the Shehai! Onsi will guide our blades! Today, the sands will run red with Elven blood!" After Yokuda's destruction several waves of refugees and warriors, known as the Ra Gada, fled to Hammerfell. Among them were accomplished sword-singers and Ansei, such as the famous "Yaghoub's Thirteen", King Xakhwan's army of sword-singers, or the fabled group of master Ansei known only as "The Four". Formidable singers such as these claimed the entire province and established a new home for the Yokudans. Various training schools for swordsmen were also built in the early days of Hammerfell. Warriors known as the Anka-Ra ventured east into Craglorn and established Hel Ra Citadel—a vast complex believed to be used as an Ansei training ground. Others established the Abbey of the Blades and the Rahni'Za, School of Warriors. Rahni'Za, supposedly dedicated to the Warrior constellation, trained students to become Sword-Disciples by completing five increasingly arduous tests of strength and skill. 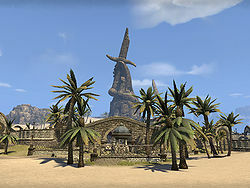 Similarly, the training school at Leki's Blade in the Alik'r Desert was built around this time after a great duel between Leki, goddess of aberrant swordsmanship, and renowned swordsman Rada al-Saran. After the battle, the last of the Ansei established the school where their sword knowledge could be passed down to later generations. Centuries later, the school remained a popular place of study and was considered the swordsmen's most holy site. Local myth claims that the spirits of the departed Ansei watch over the students training in the temple. When Hammerfell faced a great threat from a group of powerful elven necromancers, the Ansei heroes Majah, Radan, and Halelah sacrificed themselves to protect the people from the risen dead. As part of a covenant with Tu'whacca, each Ansei channeled their spirit into the blade they wielded in life. These swords became known as the Ansei Wards, and would protect the land from even the most powerful necromancy. After conquering Hammerfell, the Yokudans found themselves in a time of relative peace. Many warriors put down their swords in order to build their new nation. Within three lifetimes, many abandoned the Book of Circles and forgot the teachings of the Way of the Sword. Ansei warriors were even rarer, and although many training halls were established throughout Hammerfell, very few produced masters of the Shehai. However, a small number of renowned swordsmen did exist during this period of decline, such as Gaiden Shinji and Ansei Makela Leki. When Hammerfell came under attack from a race of giant goblins from a rent in space time, the Queen of Ojwambu pleaded with Derik Hallin, the "Last of the Ansei". According to legend, Hallin called forth the spirits of long-dead Ansei to aid him in his defense of the city. Numerous Ansei warriors appeared and fought alongside Hallin until they were victorious. Other accounts state that Hallin scoured the land to find the five mighty swords that ended a similar goblin threat during the time of Divad Hunding. Although their use was forbidden, Hallin and his companions wielded the blades and hurled the swords together into the void, defeated the goblin army by sealing them in the void between their world and Mundus. As a result, their Shehai was forever destroyed. Whatever the case, Hallin saved the people and restored the teachings of Frandar Hunding to Hammerfell. "We chose the blades and destroyed the beasts. But as a result, the Shehai—our spirit swords—were forever destroyed. Centuries of wondrous tradition was snuffed out. I must bear that weight always." Although the Redguards still honored the teaching of the Way of the Sword and were fearsome warriors in their own right, the number of sword-singers gradually dwindled as time passed. By the mid-Second Era, there were no known Ansei warriors, with native Redguard swordsmen believing the existence of Shehai to be absurd and some foreign scholars dismissed the Shehai as "superstitious nonsense". Training schools, such as Rahni'Za, were still respected and prestigious institutions among Redguards, but for unexplained reasons the Ansei simply died out. 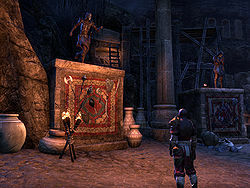 The Abbey of Blades held true to the teachings of renowned singers including Divad Hunding, Ra Abah, Ansei Kalam, and Satameh, and some students even sought to restore the ancient art, but were ultimately unsuccessful. Even veteran swordsmen of the time, such as Master Ahram Sesnit and Sai Sahan, were seen as a far cry from the Ansei of old. By the Third and Fourth Eras, Ansei were practically a myth. Although there were some who followed the old ways within the ancient Halls of Virtues of War, very few Redguards had ever seen a Shehai, let alone called forth one. Some aspects of the martial tradition survived through the eras however, as Redguards remained among the most formidable and naturally talented warriors in Tamriel. Army of the Circle: The name of Frandar Hunding's army of sword-singers who fought at Hattu Mountain. Divad Hunding: Known as the Divad the Singer, he followed in the ways of his father Frandar until choosing the life of a bard. He took up the ways of the sword again after Emperor Hira's soldiers killed his mother while arresting him, and convinced his father to form a rebellion against Hira. 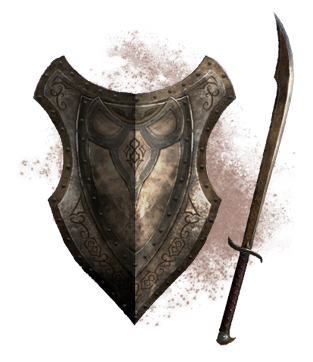 When his father was killed fighting against the giant goblins in Hammerfell, Divad took command of the Ra Gada to avenge him, and he and his band of Sword Singers worked their sacred forges and consulted eldritch tomes for many long years to create five great swords. He has companions such as the catlike Katrice and Sabasad the Shield, and entrusted the swords in the care of master guardians, the blind old Ansei. Ansei Majah, Radan, and Halelah: The three Ansei warriors who sacrificed themselves to create the Ansei Wards. The Four: The collective name for Ansei Mamireh, Akamon, Roshadon, and Rok'dun the Flame. Said to be prominent Yokudan warriors during the early Ra Gada invasions. According to legend, their prowess with the Shehai was unmatched and they single-handedly captured Nedic fortifications, breached walls, and cut down entire armies. The Glinting Talons: A fearsome Ra Gada sect prominent during the early Yokudan invasions. Known for wielding a sword in each hand, they employed a fighting style so aggressive that it left their enemies standing stunned. They venerated Diagna and the bird god Tava. The attributes of the hawk inspired their sword-songs and they were known to engrave their blades with its wings. Ancient records note heroic tales of them driving off Orcish warbands when sorely outnumbered or capturing strongholds in surprise attacks. They fought in a conflict known as the Battle of Six Hands, but much of the details are lost to history. Yaghoub's Thirteen: A vanguard of thirteen great Ansei warriors led by Grandee Yaghoub when the Forebears came ashore to Hammerfell, who had bonds of fellowship as close as brothers. Among them were Navid, who was strong but covetous, and Ihlqub, the thirteen's finest archer, who became romantically involved with a woman named Sayeedah that Navid had feelings for. Fueled by rage and envy, Navid summoned his Shehai and killed Ihlqub when he was practicing with his bow, but was wracked with so much guilt afterwards that he killed himself, with his blade becoming cursed and persisting even after his death. Ra Abah: Renowned Yokudan warrior who fought alongside Frandar Hunding in the War of the Singers against Emperor Hira. He was buried in the Valley of the Blades after his death. His teachings survived into at least the mid-Second Era. Ansei Kalam: Known as the "Master of Polearms", Kalam and his daughter, Ra Adia, swept through the Dragontail mountain passes and drove out the bandit tribes. They were both buried in the Valley of the Blades after their death. Kalam's teachings survived into at least the mid-Second Era. Ansei Satameh: Known as the Tigress of Dragonstar, she was buried in the Valley of the Blades after her death. Her sons, Ra Hasar and Ra Huzar were known as the "Twins of Sword and Spear". Her teachings survived into at least the mid-Second Era. Yokeda Razul: Fought alongside Divad Hunding, leading the Ra Gada to conquer Alik'r. When the Na-Totambu and the Yokudan nobility came sometime after, Razul made himself Yokeda to cement the power of the Ra Gada. Some remember him as the first Forebear. Mekala Leki: A Maiden of the Spirit Blade who fought in the Battle of Bangkorai Pass and slew King Joile of Daggerfall in 1E 973. She recorded her last moments in a Memory Stone, which would go on to become a valuable artifact. Derik Hallin: The last of the Ansei, who rallied the armies of Hammerfell against the giant goblin forces of Mahgzoor Rockhand. 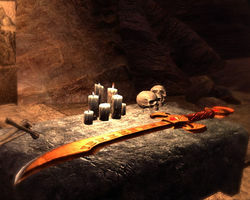 Following the will and testament of Divad on how to retrieve the five blades, he scoured the rural Sword-singer halls for virtuous companions of pure heart (three women and two men) and defeated each Ansei Master in their caves to retrieve their swords. Though the swords were hurled into the void to close the Goblin gate, it is said that the least powerful of the five survived, which still exceeds a modern blade magical or ebony by several orders of magnitude, is hidden in Hammerfell. Ansei were known to meditate using large egg-shaped crystals, many of which survived into the mid-Second Era after being passed down to their descendants. For more information, see the ESO article. This page was last modified on 21 November 2018, at 17:40.